Returning customers are always to be welcomed so when a world leading manufacturer of titanium components for the aerospace sector needed to ensure their cleaning regime could meet greatly increased production demands, MecWash was delighted that they looked no further than the Tewkesbury based company’s proven expertise. MecWash had already supplied the global company with two Solo aqueous component cleaning systems but a doubling of orders for the titanium aerospace fasteners they manufacture meant there was a need to increase cleaning capacity. John Pattison, managing director at MecWash, explains: “This company has been very satisfied with the cleaning capabilities of our Solo systems which they installed some years ago and that is why they returned to us when they needed to expand capacity. “We advised the installation of two Duo 400 machines because they are a natural progression of the established Solo system that the company has been using so successfully. The Solos have ensured that the titanium fasteners produced met the strict company cleanliness standards for many years. “The Duo has the added benefits of flood / immersion washing, which provides higher standards of cleaning by full solution contact with all component surfaces. Fuelled by increasing air travel, global aircraft demand has led to the largest order book in aviation history and a recent report1 says the aerospace fasteners market is projected to grow from USD 5.49 Billion in 2016 to USD 7.73 Billion by 2021.John adds: “I am pleased that our customer has seen such an increase in orders for its titanium fasteners and has returned to us for a new cleaning system to meet their increased production demands. “Fastening is the core technology for the joining process in the aircraft industry and a large aircraft such as the Boeing 777 can contain around million-plus of these fasteners so a robust cleaning regime is essential as any contamination could cause corrosion and affect an aircraft’s integrity. “The aerospace sector is just one of many that we serve with our aqueous component cleaning systems and I am delighted that yet another company has returned to us for our industry expertise and already reports successful results are being achieved. “The Duo 400 suits both large components and dense baskets of small parts so is ideal for this particular application because parts of many different sizes are being manufactured at the same site. The unique basket design means that parts of different sizes can be cleaned in one wash cycle, saving both time and energy costs. 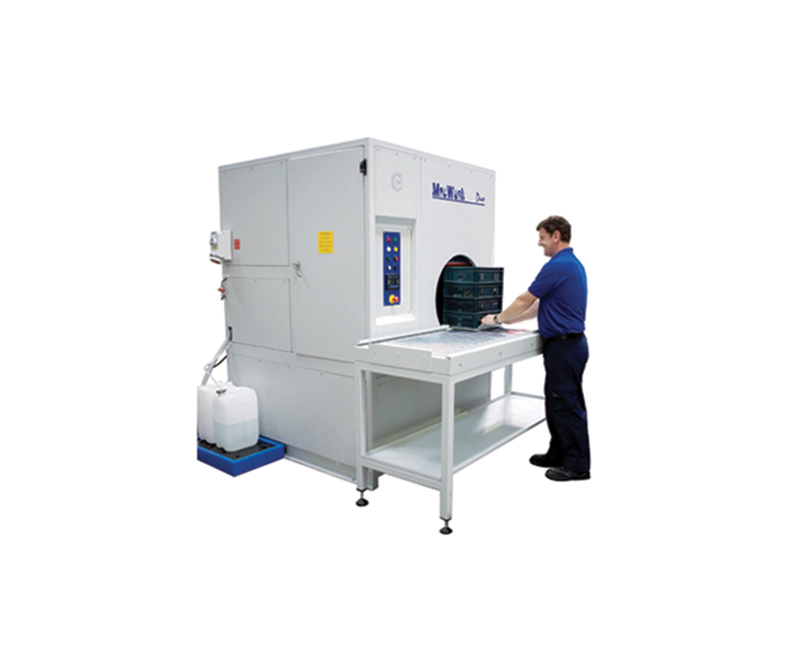 “Not only does the final wash quality meet the highest possible standards of cleanliness demanded by the aerospace industry, but the system is also efficient to operate with an intermediate wash system cost and the Duo’s footprint is small enough for a cell. “Ease and speed of use are other factors vital for our customers and again the Duo has a range of pre-set programmes with each cycle taking typically no more than 10 minutes, making it ideal to meet growing production demands,” he added.